And just before you get hooked on reading about my Amazing Journey 2.0, I must warn you... this is very long. Well, long compared to my other posts. So enjoy!! 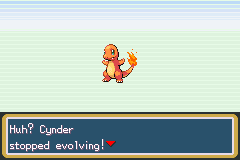 I went training Cynder, Scotch, Twister and Flash before taking on Brock. With 4 level 12 Pokémon, I was ready. Scotch took out Geodude and Onix easily with Karate Chop. 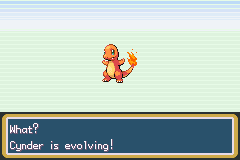 I'm so proud :') And my adventure continued on toward Mt. Moon. 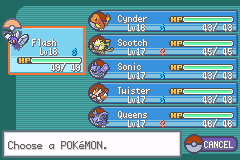 The trainers along the way were no match for my superior team. Nidoran joined my team once all the trainers were defeated. I called her Queens - now guess which kind of Nidoran it was :P I decided to buy the Magikarp off the guy in the Pokémon Centre but not use it. Because it takes SOOO long to train it up. I named it Slyther - if I do decide to use her, at least she has a cool name ^_^ Instead of having Slyther on my team, I caught a Zubat in Mt. Moon and I'll have him on my team for now. 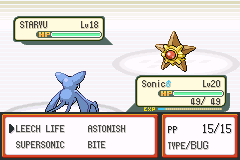 Seeing as he will evolve to be very fast, I call him Sonic. Armed with these 6 deadly Pokémon, Route 3's wild Pokémon won't know what hit it!! This is where I will be grinding to level up my Pokémon. Grinding is gaming lingo for "the process of engaging in repetitive tasks". Any time I've heard it being used, it's been to gain experience to grow levels. 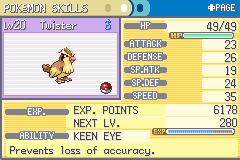 Grinding is quite important in a Nuzlocke Challenge. And that is the reason I failed so badly in my last one... Because I was grinding but doing it rather badly... :/ I didn't train my Pokémon to high enough levels because I was lazy and that mistake cost me greatly! Back to the point of my blog - after tireless minutes of work (I put the game speed on double for training), I leveled all 6 Pokémon to 15. Then we took Mt. Moon from behind and raped it down a dark alley. It felt so good to say that. Usually I don't get away with that sort of stuff... After collecting my Dome Fossil, I exited asap. The clean, refreshing mountain air filled my digital lungs. My new found energy helped me capture a weak little Rattata on Route 4 (west of Cerulean) and I called him Ramsey. Don't question my methods! And off I went - more grinding before battling Misty. I figured that level 20 was enough so once all my Pokémon were each a score in level, I took on the Water Princess. And boy was she annoying!! Onward we go. I beat up that nasty Rocket who tore up the house just above the gym. And I got TM28 off him too :D That's the move Dig. I'm gonna save my TMs for later in the game.. I don't wanna use them now only to have that Pokémon die and have the TM go to waste :/ On a less morbid note, Route 5 helped me fill up my Pokédex with an entry for Oddish ^_^ I'm very fond of Oddish personally. It's such a cute Pokémon. I had thoughts of swapping Scotch for Penny (Penny being the Oddish I caught). What are your thoughts? I've never raised one before and I'm kinda looking to vary my party a little. Scotch is great and all... but I sense that he's a disaster waiting to happen. One critical hit and BOOM. Dead. Because his defence is not that great. I have plenty time to decide what to do... Actually, it's better I decide soon rather than later! To save myself valuable grinding time... I'll come back to it. Route 6 brought me closer to Vermilion City. And the VS Seeker!! Which will be a great asset to my training regime. The VS Seeker takes 100 steps to charge and once you use it, trainers in the vicinity may start jumping up and down to signal that they're up for a rematch. It's very useful for getting money and experience! The best part is that some trainers actually have stronger Pokémon when you battle them again. Right now I'm just thinking about my party... and I've decided that I will replace Scotch with Penny. So now Oddish has joined my team. Next, I walked out to Route 11, just east of Vermilion, and I found an Ekans (I called her Cabra). I was thinking about adding it to my team but decided against it seeing as I already have 3 poison types! There's a sentence I never thought I'd say. Anyway, I took on all the trainers out on Route 11 and beat them without great difficulty. And I finished off with some grinding to level 23. Once I come back, the S.S. Anne is my next target. That's all I have on gameplay so far. But wait, there's more!! I'll leave it there for now. Long blog post is LOOOOOOOOOOOONG! Hope you enjoyed it as much as I enjoyed writing it. Tune in next time for more exciting adventures with Blaise and his Nuzlocke Challenge. Kieran, I really enjoyed this post, especially since I knew the Pokemon you're using unlike those new generation Pokemon! The nuzlocke challenge is where you have to get rid of dead Pokemon right? I know you told me before but just wanted to make sure. O2 Freaking Webtexts.. I Hate You!